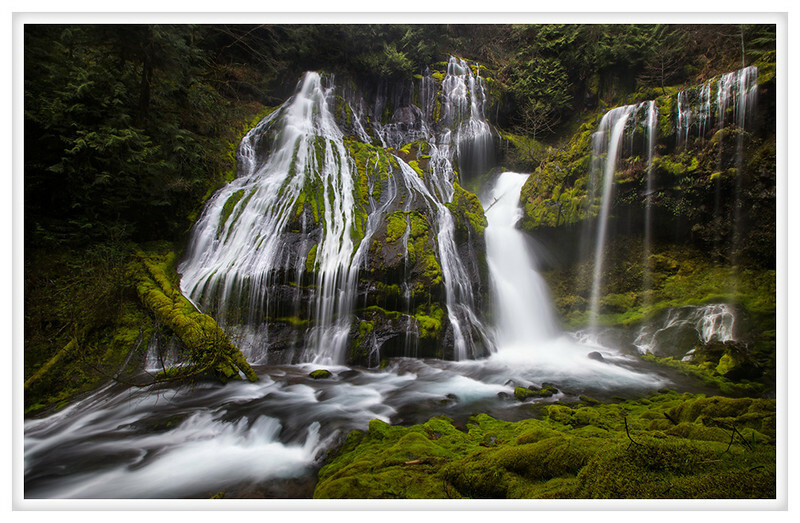 Getting down to the bottom of Panther Creek Falls is no simple task. There are two near vertical points of descent that requires you to make use of small rock outcroppings as hand and toe holds. When encumbered with a backpack full of camera gear it is made even more difficult and I was tempted to remove my shoes to ensure I had a good grip. Still, I made it safely to the bottom and was treated to a scene of unparalleled beauty. Panther Creek's waterfall is beautiful and delicate. The myriad of ways the water tumbles down t he rock is so pretty. A cool mist comes in waves and between them I took a number of pictures. Each time I wiped my filter of water droplets and waited to start again. The ground is a spongy bed of rich moss and the sound of the water hitting the stones drowns out all other noise. It is peaceful and stunning at the bottom of the falls. Fortunately it is easier to climb back up than it is to climb down the rock face.